What is the name of your band? We are called Vesperia, which means 'of the land of the evening star'. We pay homage to our country with this name. Name of the band-members? On Bass and lead vocals is myself (Morgan Rider). On guitars we have Casey Elliott and Frankie Caracci. On Drums we have Cory Hofing. Where did you grow up? The band called Whitby, Ontario it's home for a number of years as we rehearsed and played shows in that area since early 2007. We had quite a few lineup changes since the beginning of the band though so we ended up moving West to the other side of Toronto, where we are now located. How old are you? The band has been around loosely since 2005. We have been called different names in the past. Vesperia as you know it has been around since Spring of 2012.
Who started the band? I (Morgan) started the band as a side project to fuel some musical ambitions I had around summer of 2005. As my other bands deteriorated over time, Vesperia began to become my main focus. Where have you played 2012/2013? We have played dozens of shows all over Ontario and Quebec since the start of 2012. We plan on expanding outward more as the years progresses though! Where can people se you? 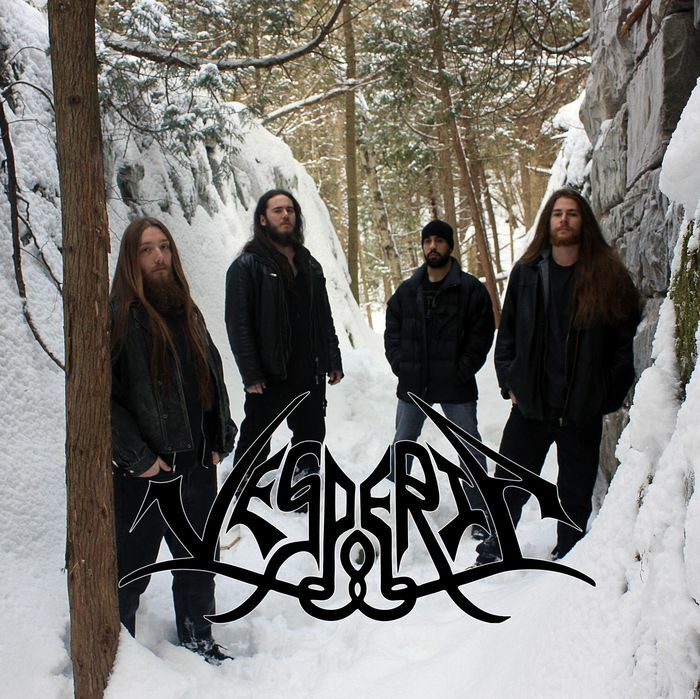 Our main online traffic sources are currently our Facebook page (http://www.facebook.com/vesperiametal) and our bandcamp page (http://www.vesperia.bandcamp.com). Do you have a web-site? We have a website being built at the moment and there are a few things still to be fixed, but there will be one online for us within the next month! What is the name of your best song? The most popular song we have (for live shows) is our song 'Forsaken Shores'. This one seems to get the best responses from crowds. It will be one of the songs on our next album, 'An Olden Tale'. What kind of music are you into? We are into everything. Especially when it comes to the individual members in the band. We all have our own tastes and inspirations. If I should speak as a whole for the band though, we love Black/Death/ Power & Folk metal and folk music. Have you been on tour this summer? We are actually planning our very first full Canadian tour this August with our brother-band Crimson Shadows. We will be hitting every major Canadian city in-between Toronto, Ontario and Victoria, British Colombia. Do you have a planed tour anytime soon? Yes, our Canadian tour as well as some ventures into the United States in the fall time. Who came up with the band name? Myself and an old member of the band came up with this band name when we were working out a bunch of new tunes. Who writes the songs? To date, I have written the majority of the music and lyrics. what song do you play the most? One song that always makes it into our setlist is the song 'With Omens of Sorrow'. This is going to be the opening track on our new record. Do you play the same songs each performance? We like to change it up every show, but yes the same songs to recur quite often. Have you realesed a album or single? We re-released an album we made under our previous band name and it is called 'Voyage from Vinland'. We also have a new demo we made under the name Vesperia. It is called 'The Swordsman'. Are you working on any new songs? We are always working on new songs!